A friend in need is a friend indeed is an apt description of the late Datuk Ho Koh Chye — as far as Datuk R. Yoges-waran is concerned. Yogeswaran, who used to play hockey together with Koh Chye in the national team for almost a decade in the 50s and 60s, was devastated to hear of his great friend’s demise. Former Olympian Koh Chye died at the age of 66 at a hospital in Kelana Jaya on Wednesday. He had undergone surgery for prostate cancer last week and was readmitted due to complications. Deeply Missed: Perak's Sultan Azlan Shah paying his last respects to Datuk Ho Koh Chye at a church in Kelana Jaya on Thursday. “I first knew him during our days together at the teachers’ training college in Penang. That was also when he met his wife,” said Yogeswaran yesterday. “He studied at the St Paul’s Institution in Seremban and later taught at a school in Kuala Pilah before being transferred to King George’s school in Seremban. “He was a very dedicated player and always gave his best ... he always had words of encouragement for his team-mates before matches. Yogeswaran also described Koh Chye as someone who was passionate about sports in general and hockey in particular. “Datuk Ho used to call me almost everyday to talk and discuss about sports. I enjoyed talking to him as he was a very down to earth person and a very good listener,” added Yogeswaran, who was the national hockey team manager for 2002 World Cup in Kuala Lumpur. “He was a very dedicated person and took his job very seriously. He has great passion for sports and has dedicated his entire life for sports. “You can never find another person like him ... he was a committed player and a dedicated and thinking coach and team manager. “He has achieved everything in sports as an athlete, coach, team manager, sports administrator and chef-de-mission of the Beijing Olympics Games. “We are shocked to hear of his demise as he was a true sports legend. It’s a great loss to the nation. Olympic Council of Malaysia (OCM) secretary Datuk Sieh Kok Chi also described Koh Chye’s death as a great loss to the nation. “We are sad over his demise as he was a great sportsman who dedicated his entire life to the development of sports in Malaysia, especially hockey,” said Kok Chi. “He was one of the best goalkeepers Malaysia had ever produced. It is a great loss to the country. Datuk Ho was a dedicated coach who helped us finish a respectable fourth in the 1975 World Cup in Kuala Lumpur. He was a very disciplined person and believed there was no short cut to success. Datuk Ho was my mentor. He was the reason why I made it in hockey. He turned me into a good goalkeeper in the 1975 World Cup, thanks to his advice and guidance. He was a very dedicated player and always gave his best ... he always had words of encouragement for his team-mates before matches. He was a true friend who stayed in touch with me until his death. I not only lost a friend but a brother. 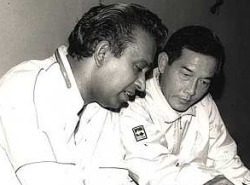 He was a great sportsman who dedicated his entire life to the development of sports in Malaysia, especially hockey. He was one of the best goalkeepers Malaysia ever produced. He was also a great sports official, who had done a lot for Malaysian sports. It is a great loss to the country. Malaysia have lost a great sports official. I last met him during the Beijing Olympic Games and he was very professional in handling matters. I am surprised to hear of his death. He was a great person. We, in the MTBC, appreciate him a lot for helping us start the junior bowling circuit in the SportExcel when he was the executive director then. He was a dedicated sports official and we are really shocked to learn of his death. I only got to know him during the Beijing Olympic Games but he left a lasting impression on me. In that short time, I learnt a lot from him. I discovered how knowledgable and passionate he was. He was truly a sportsman who loved his country. A true sport administrator and a successful athlete. He gave great support for the development of gymnastics in the early days.